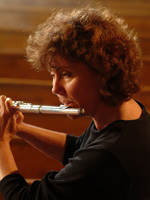 Flutist Anne Thompson is a native of Peterborough Ont. and received her early musical education there before entering the Bachelor of Music program at Western University. While an undergraduate, she became a member of Orchestra London and later played with the Calgary Philharmonic Orchestra for several years before receiving a Canada Council grant for further study in the U.S. After a year of study with flutist Geoffrey Gilbert, she attended Yale University where she studied under Thomas Nyfenger and performed at the Norfolk Summer Music Festival. Upon receiving the degree of Master of Music Performance from Yale, she returned to Canada to join the Don Wright Faculty of Music at Western, where she still teaches. Ms. Thompson lives in Toronto, where she is a busy free-lance artist. She has appeared with the Toronto Symphony Orchestra, the National Ballet Orchestra, the Mississauga Philharmonic, Continuum New Music Ensemble, the Kitchener- Waterloo Symphony, the Hamilton Philharmonic, the Talisker Players, the Winnipeg Ballet Orchestra and all of the Toronto theatre orchestras, and is a frequent performer on CBC Radio in chamber and orchestral setting. With Continuum Contemporary Music, she has performed on CBC, BBC and VPRO. In January 2010, Continuum released their fourth CD, Raw, featuring chamber music of James Rolfe and in February, returned to the Montreal New Music Festival. In the summer of 2012, Continuum premiered Christopher Butterfield’s new opera, Contes pour enfants pas sages and performed at Chamberfest Ottawa.